The answers were relatively evenly divided between “yes” and “no.” I support the “yeses,” the reason being, the gascolator does supply one more chance to trap dirt and water that might find it's way into an aircraft fuel system. Historically, the gascolator was added to older aircraft to collect contaminants in the fuel system as, often, the fuel supplied would contain dirt and water, but today we are seeing a lot of homebuilts without this sensible device. Why the change? Do we now assume that our fuel supply is clean and free of any impurities? 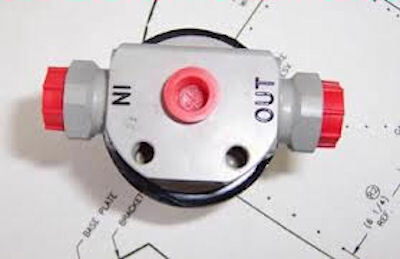 Do you check the condition of your fuel cap seal, every time you preflight? Do you believe that if your aircraft is hangared, that there is no chance of water entering the fuel tank? What about condensation? Let us have a look at the design and function of a gascolator. In years gone by, some designers made their gascolators with a glass bowl or cylindrical glass sided bowl so as to allow a visual inspection of the fuel and filter for any contaminants; however glass does have the disadvantage of not being too good at crash survivability. 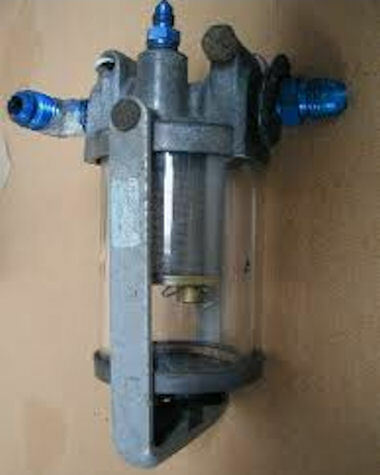 However, the basic requirements of a gascolator are visible: Inlet, outlet and third port for the engine primer system. Not visible is the quick drain which is usually fitted to the bottom of the unit to drain off any sediment or water. Visible through the glass (above left) is the fuel filter screen; this is usually in the region of 100 micron and should be of a stainless steel type and NOT a paper element, (above right) which is common in automotive and industrial applications. The reason being, that if water were to be absorbed by the paper element, the matrix would swell and reduce or stop the flow of fuel. All gascolators will be marked with an IN and OUT port. It is important that the fuel flow be in the correct direction, so as to ensure that any sediment will fall to the bottom of the bowl and be drained off with any other contaminants through the quick drain, and with the correct fuel flow, filtered fuel will be supplied to the primer. 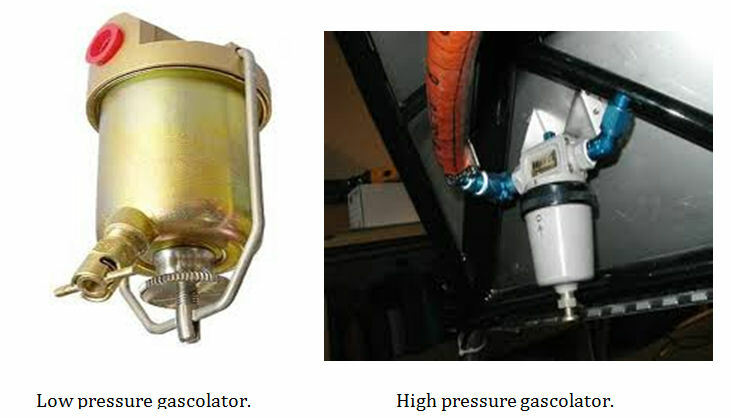 A gascolator should be mounted at the lowest point in the fuel system, so as to ensure that water will gravitate towards this point, so that it can be removed. In some aircraft; this results in the fuel being piped towards the rear of the aircraft and then forwards again towards the engine(s). 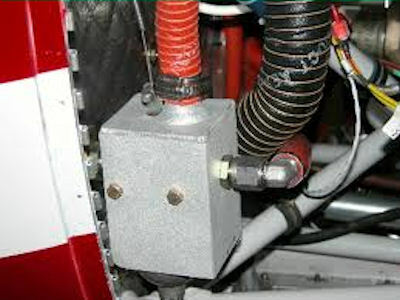 In many homebuilt aircraft, it is often difficult to mount the gascolator at the lowest point due to various reasons and as a compromise an extension is required to allow access to the quick drain. This is an acceptable modification as it is important to check for water or contaminants regularly during preflights and inspections. Van's gascolator with an extension added due to the engine mount structure preventing (complicating) the mounting of the unit lower on the firewall. 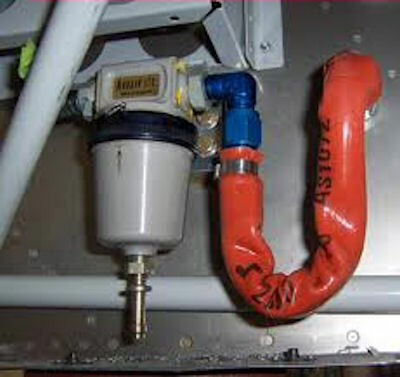 This is a bad example of plumbing to the gascolator as the 'U' in the fuel supply pipe serves as a wonderful water trap and the tight bend in a flexible hose, (if fitted) could result in a kink in the fuel pipe which will reduce or prevent fuel flow. If a soft aluminium pipe is fitted, a small amount of trapped water could lead to corrosion in the pipe and an eventual fuel leak. Generally a bad idea. 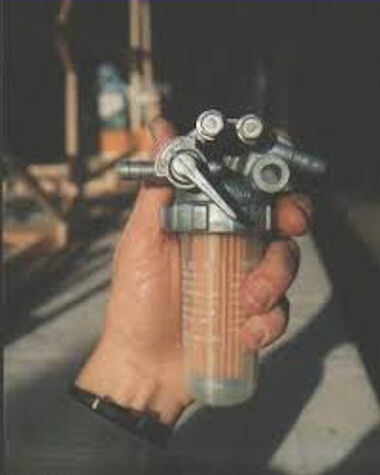 So; back to the original question… Do only carbureted engines require a gascolator, or do fuel injected aircraft also need one? I believe that ALL aircraft engines should have a gascolator, which is rated for the pressure of the applicable fuel system and this would depend on the location of the gascolator, the type of aircraft (high wing / low wing) and the fuel delivery pressure. Carbureted engines operate at up to 6 PSI, Lycoming-type fuel injection systems operate at up to 35 PSI, whilst Continental-type fuel injection systems operate at up to 65 PSI. As a result you should choose the gascolator with these factors in mind as a minimum requirement. 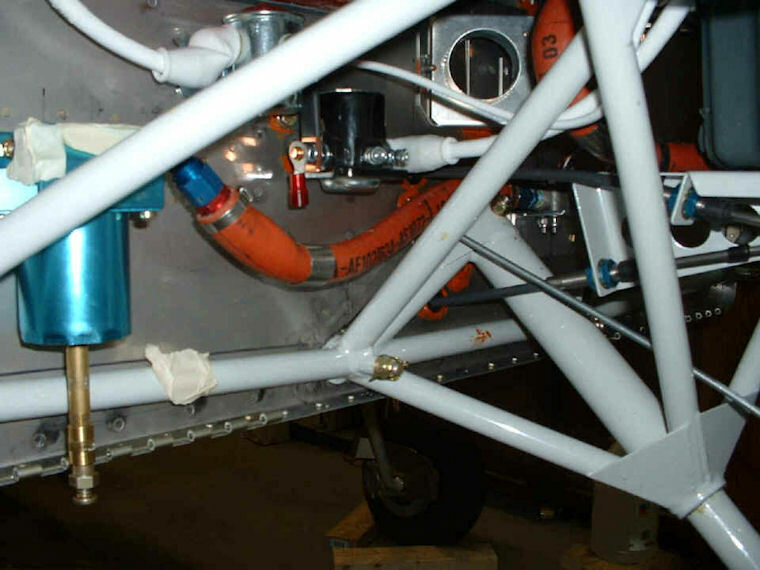 With a gascolator mounted forwards of the firewall, a downside is the exposure of the unit and the plumbing, to the engine compartment heat in a tightly cowled modern homebuilt aircraft. To prevent, or minimize the chance of fuel vapourisation the unit should be covered by a shroud, which is supplied with a blast of cooling air, and the fuel pipes should be covered with an insulating material. I can hear the “no's” complaining that a gascolator is not required as they only buy fuel from reputable sources and drain their fuel tanks regularly… I believe that an extra filter, some extra space/volume to catch contaminants before they are delivered for combustion, is a good thing… The positives of a gascolator outweigh the negatives. The question is: what do you think?